Columbia University Press, 9780231158756, 304pp. From the beginning of the American Occupation in 1945 to the post-bubble period of the early 1990s, popular music provided Japanese listeners with a much-needed release, channeling their desires, fears, and frustrations into a pleasurable and fluid art. Pop music allowed Japanese artists and audiences to assume various identities, reflecting the country's uncomfortable position under American hegemony and its uncertainty within ever-shifting geopolitical realities. In the first English-language study of this phenomenon, Michael K. Bourdaghs considers genres as diverse as boogie-woogie, rockabilly, enka, 1960s rock and roll, 1970s new music, folk, and techno-pop. Reading these forms and their cultural import through music, literary, and cultural theory, he introduces readers to the sensual moods and meanings of modern Japan. As he unpacks the complexities of popular music production and consumption, Bourdaghs interprets Japan as it worked through (or tried to forget) its imperial past. These efforts grew even murkier as Japanese pop migrated to the nation's former colonies. In postwar Japan, pop music both accelerated and protested the commodification of everyday life, challenged and reproduced gender hierarchies, and insisted on the uniqueness of a national culture, even as it participated in an increasingly integrated global marketplace. 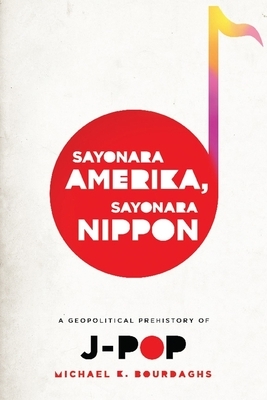 Each chapter in Sayonara Amerika, Sayonara Nippon examines a single genre through a particular theoretical lens: the relation of music to liberation; the influence of cultural mapping on musical appreciation; the role of translation in transmitting musical genres around the globe; the place of noise in music and its relation to historical change; the tenuous connection between ideologies of authenticity and imitation; the link between commercial success and artistic integrity; and the function of melodrama. Bourdaghs concludes with a look at recent Japanese pop music culture. Michael K. Bourdaghs is associate professor of modern Japanese literature at the University of Chicago. He is the author of The Dawn That Never Comes: Shimazaki Toson and Japanese Nationalism and a translation editor of Natsume Soseki's Theory of Literature and Other Critical Writings and Kamei Hideo's Transformations of Sensibility: The Phenomenology of Meiji Literature.